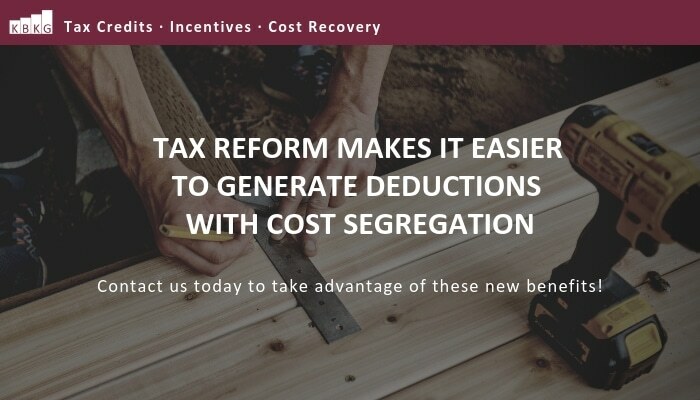 In 2018, the tax reform changes made cost segregation studies more valuable than before. Under the new law, any building components with a tax recovery period of 20 years or less, are eligible for 100% Bonus Depreciation. Historically, bonus depreciation only applied to newly constructed property, but now it’s available for any acquired property. These components can be easily identified with the help of a Cost Segregation Study. These requirements, among other criteria, can be examined during a proper cost segregation assessment. While there are other considerations to make when applying for bonus depreciation, an experienced cost segregation engineer can help you or your CPA navigate the complexities for an optimal outcome. Contact us today to take advantage of these new benefits.